Modern three bedroom home in the sought after Pinot Grove subdivision of Martinborough. The home has a large open plan living space with excellent indoor outdoor flow. The 3 bedrooms are spacious, master with ensuite. Queen sofa bed in lounge. Tuscan Sanctuary is ideally positioned for all day sun. The home is suited for a group of friends or families. Large outdoor entertaining decked area, ideal to enjoy the award winning wines from the local vineyards. The home has 4 bikes, a set of golf clubs and tennis rackets for your use while staying. Tuscan Sanctuary is part of Pinot Grove which has shared recreational facilities. These include tennis court, heated swimming pool and trampoline. Please note pool is closed over winter months. As well as bathroom towels - there are towels for the pool in the rooms. Fabulous accommodation. 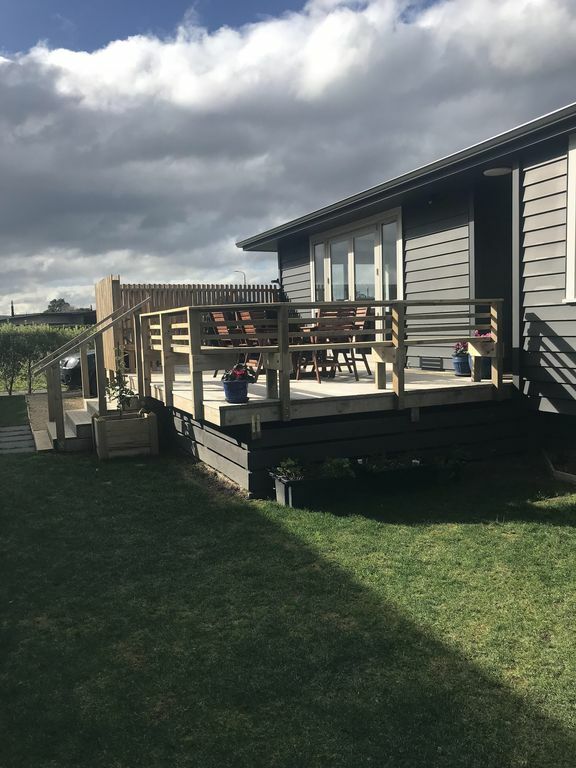 Everything you could possibly want and within walking distance of Martinborough restaurants. Thanks!! So glad you enjoyed your stay. Thank you so very much for leaving the house so clean and tidy! Great location and fantastic amenities. The property had everything there, plus a few touches that were above and beyond. and it was lovely and clean. Paula’s recommendations for eateries, etc were great - we tried them all and loved them. Suffice to say, we enjoyed our stay! Thank you for loaning us your holiday house. We thoroughly enjoyed ourselves and found everything right ready to walk into and enjoy - comfortable, spacious and modern. From the pictures we assumed the pool was part of the property and were a little sad to discover it wasn't. But then it wasn't far away and your generosity well made up for it. Thanks Kim - and thanks for leaving it so tidy, it’s very much appreciated. We were so impressed with this property and will definitely book again. A modern, spotlessly clean home in a brilliant location. The owners have thought of everything you might need to make it a home away from home including little touches like nightlights in the bathroom so you can find your way at night and heaters, cooling fans and extra bedding in each wardrobe. The recreational facilities are the cream on top. A real holiday experience. Highly recommended. Thanks April, I'm so glad you enjoyed your stay! If it had a Sky connection we would have rated it 5 star!